This article is being written as an addition to my original article posted as a web page on my POEM Web Site entitled “Why the Post-Tribulation View of the Rapture Doesn’t Make Sense”. This article was also posted to my POEM Blog on January 5th, 2011. If you have not read that article before reading this one, you might want to read it before reading this one further by clicking either of the preceding hyperlinks. You may also click the next embedded link to download the PDF version of the same article at my POEM web site. Note here that the disciples asked Yahshua two distinct questions. In asking: “Tell us, when will these things be?”, the disciples were seeking to know how to recognize when the destruction of the Temple and city of Jerusalem were near so that they could flee before it happened. But the second question, which was: “What will be the sign of Your coming, and of the end of the age?”, related to Yahshua’s return to set up His Kingdom. Woefully, however, though the disciples saw Yahshua as the prophesied Messiah, they fully expected Him to conquer the Roman oppressors and re-establish David’s throne and kingdom immediately after the destruction of Jerusalem. The disciples had no concept of the suffering that Yahshua was soon going to undergo as the Lamb of God and atonement sacrifice for our sins, or that there was going to be a long delay before Yahshua returned to Jerusalem to lead their fellow Jews to set up God’s Kingdom. The point here is that the disciples had no idea that the two questions covered two distinctly different time periods in history that were to be separated by over 2000 years! This means that Yahshua’s reply has to be seen in this light, with a portion of it pertaining to their current time in history and a portion of it pertaining to ours. Thus, though Yahshua warned his disciples to “take heed that no one deceives you” in Matthew 24:4, they had already been deceived by their former Jewish religious leaders. In an attempt to warn His disciples that they were confused, Yahshua did not answer their first question initially, but their second one. But until the Holy Spirit was sent to baptize the disciples and Apostles on the Pentecost or Shavuot after Yahshua’s death and resurrection, they did not understand Yahshua’s reply in context. Furthermore, those without the Spirit are still having trouble figuring out what Yahshua meant today. Let’s examine Yahshua’s prophetic words in light of the two different time periods being referred to. In verses 5 through 14 of Matthew Chapter 24, Yahshua is citing the trouble that began in the early church when Pagan Rome and the Jewish leaders saw all the new believers in Yahshua and the rapidity at which this new philosophy spread among the Gentile nations as a major threat to the established order. This era saw a huge rift form between the Jewish synagogues and Gentile Christian congregations as the Jews who rejected Yahshua’s free gift of Grace insisted on keeping all the ancient religious rituals that they loved alive. In order to do this, the Jews forcibly expelled the new believers in Yahshua from their synagogues if they did not see a need to keep the same rituals or remember the Jewish Feasts in the same way. As a result of this rift, the Gentile believers that had rejected many Jewish religious restrictions and developed their own unique rituals and view of theology based on New Covenant principles suddenly found themselves without public places of worship. This caused the schism between Messianic Jews and Gentile Christians to deepen even further, and many Jews began to hate and betray their Christian brethren by turning them in to their Roman overseers, who mercilessly raped, pillaged, imprisoned, martyred and enslaved all of the peace-loving new believers that had the misfortune of being caught. Eventually, though Gentile coverts fellowshipped with one another in their homes and in secret meeting places, some of them also began to congregate publicly in the synagogues of the Samaritans, who neither persecuted nor rejected Christian believers, but openly accepted them. As a result, some Gentile believers were deceived because the Samaritans had erroneously mixed Pagan and Jewish religious ideas together. As a result, some believers eventually rejected sound theology, taking on Pagan customs that the Roman Emperor Constantine would tragically also embrace. The false prophets mentioned in this passage are also are easy to identify in our age. These were the warped intellectuals of the late 19th and early 20th Centuries that inspired such religious philosophies as Mormonism, Theosophy and Rosicrucianism, and political ideologies such as Nazism and Communism. Though resembling Christianity, Mormonism professes a different Messiah than the Christ of the Bible and defines salvation in a completely different way. Adding to this deception, the two non-Christian religious ideologies that rose up back then profess the false belief that Christ was not a divinely sent Messiah but only a wise man who became a wise spirit-being or ascended master upon his death. They also erroneously teach that everyone eventually finds salvation and ascends to a higher spiritual reality like Christ did and no particular religious ideology is superior over any other. In addition, the two major political ideologies that arose in the 20th Century developed fanatical leaders that viewed Christ and those who followed Him in truth as enemies of the state. The religious, social and political unrest of the Twentieth Century was triggered by the rise of these destructive religious and political ideologies that led to the deprivation, imprisonment and death of many Christians and Jews in World Wars I and II. Nonetheless, throughout that terrible time of trouble, some of those who were unjustly imprisoned and brutally treated were given opportunities to witness to others about their enduring faith in Yahweh God and His Son - even in the midst of terrible suffering. The major wars that severely affected forty years of the Twentieth Century were then followed by many devastating smaller wars such as the Korean War, the Vietnam War, the Six-Day War, and the Gulf War. Out of these wars, amidst much pain and shedding of blood, the current east-west ideological division between the Christianized moderately socialistic Western nations and the communistic, Islamic and Paganistic Eastern nations has been forged. This has placed all the world’s political powers on a steep precipice of antagonism and hate from which there is no escape, and that can only lead to their eventual catastrophic demise in the wake of the Antichrist’s desire to place the entire world under His evil and totalitarian control. The preceding Scripture is clearly teaching about the destruction of the Temple in 70 AD and the subsequent annihilation of Jerusalem. At that time, the “abomination of desolation” referred to the Pagan standards of the Roman legions that entered, sacked and burned the Temple in Jerusalem. But we have been told that it also alludes to a future time not far off, when the Antichrist is supposed to seize Jerusalem, declare his divinity in a newly rebuilt temple, and demand to be worshipped - just like any one of the many humanistic totalitarian Communist rulers of the past century. But I question the validity of this theory. Could it be that abomination of desolation of this age has to do with the Al Aqsa Mosque atop the Temple Mount today? After all, Allah is NOT Yahweh, the God of Abraham, but an ancient Pagan Moon Deity that was worshipped in Arabia long before the time of Christ. This Scripture makes it clear that the Messiah we should be expecting won’t be found on Earth in any ordinary situation such as living in a house like Yahshua did during His First Advent, or out in the desert like John the Baptist. Instead, He will be seen returning from out of the heavens and coming in the clouds with great glory and the swiftness of lightning. By mentioning this, Yahshua makes it clear that verses 19 through 27 of Matthew Chapter 24 aren’t directly alluding to the events of the First Century AD. Instead, since the very first verse mentions a great tribulation that will be far worse than anything that has troubled humanity since the beginning of the world until that time, it appears that Yahshua is speaking about the Great Tribulation described in the Book of Revelation. In this tribulation, the entire world will be plunged into a living hell of suffering and misery that would extinguish all life if it were not brought to an abrupt end by Yahshua’s return with His angels and saints to fight at the Battle of Armageddon. Since Yahshua was referring to the Great Tribulation in verse 19, it is natural to assume that the next verses pertain to the Great Tribulation also. Therefore, when verse 29 speaks of “the tribulation of those days”, it seems logical to assume that the tribulation it is referring to would be the period immediately after the Battle of Armageddon. But, if Yahshua is referring to the Great Tribulation, then why does He mention all the tribes of the Earth being present to mourn as if they will all still be alive and well at that time? After “the tribulation of those days” in verse 29 is mentioned, we are told that “the sign of the Son of Man” will appear in “heaven,” meaning the physical heavens that surround the Earth. Thus, it will be a celestial sign connected to the Gospel in the Stars that will come during a lull in the massive fighting amongst nations seen in World Wars I and II. In addition, we are told that Yahshua will gather His elect from one end of the heavens to the other shortly after at that time. But this will not be the case after the Battle of Armageddon, since Yahshua’s elect will accompany Him to fight that battle riding on white horses. Who, then, are Yahshua’s angels being sent to gather up? Now, it pays to note here that there is no mention in any of the parallel passages in Matthew, Mark or Luke that describe Yahshua’s visible coming in the clouds that suggests that Yahshua is going to vanquish the wicked at that time in the Battle of Armageddon. There is, for example, no mention of Yahshua touching down on the Mount of Olives or going to the Valley of Jehoshaphat to fight the wicked. Instead, these passages all suggest that Yahshua is going to come down to the level of the clouds of the heavens to visibly show His Glory while His angels gather His elect saints from one end of the Earth to the other. We can therefore infer that Yahshua is not coming to fight the wicked at this time, but rather to collect and transform those who are anxiously waiting for Him to take them to Heaven in the Rapture. This parallels Yahshua’s Ascension into Heaven exactly ten days prior to Pentecost or Shavuot. Before continuing, it must be stressed here that the Jews count the 49 days between the time of the firstfruits offering and Shavuot incorrectly from the day of Passover rather than the first day of the week following the regular Sabbath during the Feast of Unleavened Bread. Because of this, their Feast of Shavuot or Firstfruits is on the wrong day. If figured correctly, the offering of the firstfruits of the barley harvest would have been made in the Temple to Yahweh in Jerusalem on April 24th in 2011, and Easter or Resurrection Sunday appropriately fell on that exact day this year. Because this is the correct date for that offering, Shavuot actually fell on the Sunday of Pentecost on June 12th this year - exactly 50 days from Easter and 3 days before the Blood Moon in the constellation Ophiuchus. Interestingly, Ophiuchus depicts Yahshua and His followers as the Restrainers of the Serpent in Ophiuchus’ strong arms. This serpent, which is a constellation that is connected to Ophiuchus, is called Serpens the Serpent and it signifies the Serpent Seed or followers of Satan. Now, though the First Rapture is tied to Pentecost and the Summer wheat harvest that follows it as a marker of the end of the Age of Grace, no one knows the exact day or hour of the Rapture. Furthermore, Yahshua said that He would come at a time when we least expect it. This means that it will likely not be exactly on Pentecost or any other prescribed holy day such as Yahshua’s Ascension day that was ten days prior to Pentecost. Nor will it likely be on the Summer Solstice, despite the fact that many monuments that are connected to the Messianic constellation called Orion point to the Summer Solstice. What all of the Summer Solstice and Orion-oriented ancient monuments like Stonehenge, Thornborough Henge, the pyramids at Teotihuacán, and the Pyramid complex at Giza in Egypt do strongly suggest, however, is that the Rapture will occur in the summer months between mid-June and mid-September. There are also biblical clues in the Book of Ruth and the Song of Solomon that the Rapture will be in the summertime before the Autumn Jewish Feasts. In addition, the Rapture may come in two stages. I clearly explain my reasons for believing this in my article “Come Up Here and Come Away” (available free at my POEM web site here: http://pillar-of-enoch.com/essays/index.html#Maranatha). Now, in regard to Yahshua’s Second Coming, is it possible that Bible Scholars have been mistranslating Matthew Chapter 24, verses 29 through 31 as describing the Second Coming of Christ to do battle with the wicked when it is actually speaking of the Rapture? Could this be the time when Yahshua will come to save the elect from having to suffer through the Great Tribulation, which refers only to the last three and one half years of the seven-year Tribulation? The context of Yahshua’s words in Matthew Chapter 24 in relation to the Book of Revelation suggest that the elect saints being gathered up are not going to immediately fight the wicked at that time, but that they will go to Heaven to be with Christ for a time beforehand. The above passage appears immediately after Yahshua mentions the Sign of the Son of Man and the gathering up of His Bride the True Church from the four winds of Heaven. In it, Yahshua says that the coming of the Son of Man will be a surprise upon an unsuspecting world, and - as clearly shown in the Tribulation article that I referred to at the beginning of this article - there is no way that the world will be unsuspecting of Yahshua’s return by the end of the Tribulation! Indeed, there is no way that they will be unsuspecting even fairly early in the Tribulation since the pole shift and crustal displacement that could potentially wipe out billions of people is connected to the opening of the Sixth Seal in Chapter Six of the Book of Revelation. It is also interesting to note here that Satan is the usurper of Christ who now serves as the ruler or prince of this dark world. Satan is therefore the one being referred to in the above Scripture as “the master of the house.” Meanwhile, the thief in this passage is none other than Yahshua our Messiah coming to steal His bride away at night while his enemies are sleeping. It is my belief that Jacob’s Trouble is connected to the Tetrad of Blood Moons of Full Lunar Eclipses that will occur in 2014 and 2015 on Passover and Sukkot in both years. To see exactly when these Blood Moons will occur, and what they might mean prophetically, see my Revised 2013 Tribulation Time Chart by clicking on this embedded link. If the time of Israel’s greatest distress falls somewhere during these Blood Moons, then this will be a time of spiritual and physical terror for both believing Jews and Gentiles who will become the Tribulation Saints and it is rapidly approaching. Indeed, we are certainly living in the very last moments of this apostate age, and soon Yahweh God will destroy the governments of this world and set up a righteous theocracy that will last for a thousand years. According to the Scriptures listed above, the Sign of the Son of Man will occur shortly after the Sun is darkened, the Moon is turned to blood and the stars fall from heaven. As I described in my previous article “Heavenly Signs of 2010 and 2011,” the Sun was darkened in a Total Eclipse over Easter Island on July 11th, 2010 and the Moon turned to blood on December 21st, 2010 over the sword of the Messianic Sign Orion, which is one of several powerful Signs of the Son of Man coming in power and glory that can be found in the Gospel in the Stars. Now all that may remain is for the world to see the stars fall from the heavens, perhaps as in a meteorite shower that will precede the Sign of the Son of Man. This massive meteor shower could be associated with one of several annual meteor showers that are visible in Earth’s skies at various times in the year. Significantly, two of the most visible meteor showers annually are the Perseids and Leonids, which are both associated with the Comet Swift-Tuttle. The Perseids radiate outward from the Messianic sign of Perseus the Breaker, which is above the sign of Taurus. These are prominent in late July through mid August every year. Later in the year, around November when Comet Elenin will be prominent in Earth’s skies, the Leonid meteorite shower originates in the region of the sky governed by the constellation Leo the Lion that signifies Yahshua coming as a conquering king. Significantly, these two meteor showers both fell between the Solar Eclipse of July 11th, 2010 and the Blood Moon of December 21st, 2010 and were reported to be unusually heavy last year! 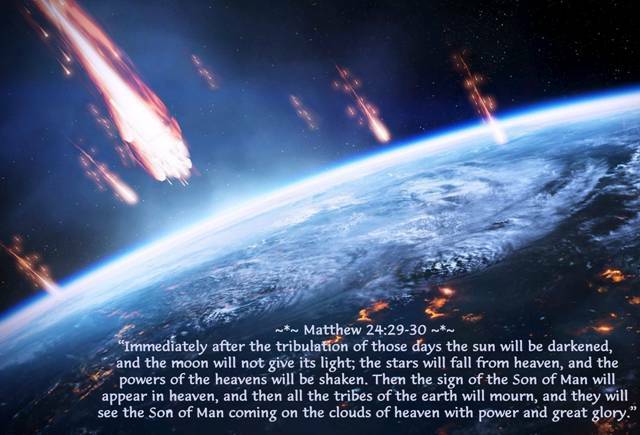 If the Rapture will be sometime in the summer of 2011 or 2012, Scripture suggests that we should expect a heavenly disturbance such as an impressive meteor shower and an accompanying celestial event that will serve as the Sign of the Son of Man in the heavens. If the Rapture is coming soon, it is possible that the sign preceding it will be more spectacular than a simple line-up of planets in the Messianic Zodiac Signs. If so, it may include one or more comets, a Supernova, and/or some strong planetary configurations such as are found in a heavenly Grand Cross like the two that have already occurred in June 2010 and June 2011 (See My Tribulation Time Chart, linked to 2 paragraphs below…). Yet, though the Rapture will likely be marked by a Sign of the Son of Man in the heavens surrounding the Earth that the whole world will see, there is also likely going to be another powerful sign marking Yahshua’s true Second Coming to conquer the wicked at the Battle of Armageddon. I believe that this Sign of the Son of Man returning as a conquering king will center on Orion’s connection to the pyramids at Giza, which were built to signify not only the belts stars of Orion, but the crucifixion of Christ that paid for all sin. However, the Great Sphinx’s connection to the signs Leo and Virgo and to Yahshua as the First and the Last will also come into play. On September 20th, 2017, these special criterions will fully be met via Orion, Leo and Virgo, the Sun and Moon, and the planets Jupiter and Venus. Fascinatingly, though this passage of Scripture begins by focusing on the distress of the nations over the beginning plagues of the Tribulation that will lead to World War III, it ends by encouraging the believers who will be alive to see these troublesome times come to pass that their deliverance from the Earth in the Rapture won’t be far off. Instead, they will be redeemed from the suffering of the rest of the Tribulation and carried away to the mansions in Heaven that Yahshua spoke of when He was dying on the Cross and that Yahweh God the Father has prepared for the Bride of His One and Only Begotten Son. NOTE: A further extension of this article can be found in my article “A Gathering of Eagles - A Hidden Parable” (Web: http://pillar-of-enoch.com/essays/A-Gathering-of-Eagles.html, PDF: http://pillar-of-enoch.com/essays/A-Gathering-of-Eagles.pdf).